For the safety of our players and spectators, as well as to maintain our fields, we respectfully ask that you do not bring your dogs or other pets to the fields. From the PA Turnpike (Exit 351) Philadelphia, go south on US Route 1 (Roosevelt Boulevard) for 1.8 miles to Southampton Rd. Turn right and soccer fields are immediately to your left. For Hornig Rd fields, continue on Route 1 past Southampton Rd to next light, turn right on Hornig Rd. From Philadelphia, proceed north on US Route 1 (Roosevelt Boulevard), 0.4 miles past Woodhaven Rd and turn left onto Hornig Road (first light) or Southampton Road (2nd light). 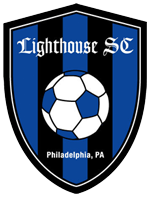 Lighthouse Soccer Club is located across from Benjamin Rush State Park.